From a book idea to a feature film...in 16 years. A journey of discovery, lucky breaks, frustrating obstacles, many helpful people, fear of failure, and a once-in-a-lifetime experience not to be missed. February -June 1997: The journey began Feb. 27, 1997, as I set off to the West Virginia coalfields to write an article on mountaintop removal mining in (U.S. News & World Report). Law professor Pat McGinley gave me a paperback version of A Civil Action. I visited Vicky Moore in Blair, and was astounded by destruction of historic community, 20-story dragline shovel hanging at edge of mountain above houses, dozens of burnt houses as people flee mining. August 1997: Article published. Soon after, I met Trish Bragg. Then Joe Lovett, in his first week as a practicing attorney, called me because a resident of Blair had appeared in his office with my article. Somehow, I sensed this could be the start of another landmark civil action. Trish joined the lawsuit, which, by luck of the alphabet, bears her name. So I rolled the dice and decided to write a book. Best way to write narrative nonfiction book is to watch events unfold. That's what I did, for years, with no idea how the story would end. Winter 1998: At the West Virginia Legislature, coal lobbyist Chris Hamilton teased me that my book, yet unwritten, should be a movie. 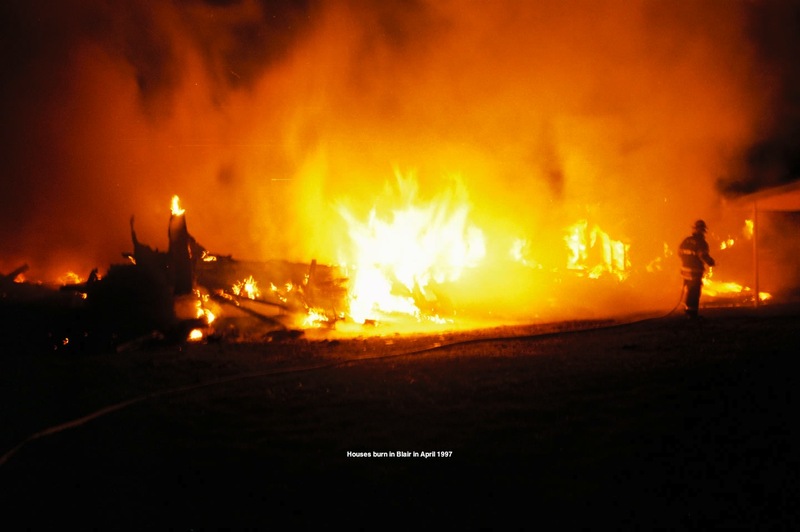 2001-2004: Horrific floods hit the coalfields, beginning July 8, 2001. Legendary filmmaker Bob Gates and I spent much of four summers documenting how land disturbances from valley fills, logging, and gas well roads had made the flood damage much worse. Documentary named "Mucked." Photos and stories of the flooding, as well as of many other coalfield communities, are on www.wvcoalfield.com. Started in 1998, it hasn't been updated much since 2005. Winter 2004: Took a screenwriting course at local community college in northern Virginia. Teacher Khris Baxter thinks it’s a great story. A movie is about one person’s journey, I learn. Trish Bragg is okay with this, as long as others get credit, too. In September, with Khris’s help, I finished the first version. Entered it in a few screenwriting contests. Was surprised it actually got two runner-ups, including top five at the Gloria Film Festival in Utah, which showcases films that stir the soul, heal the heart and enrich the world. Exactly what Trish’s story will do. Summer 2006: Screenwriting contests can lead to sales of scripts to production companies. Wasn’t happening, so I took Dov Simens’s legendary two-day course on how to produce a movie for $200,000. Walked away inspired and determined. 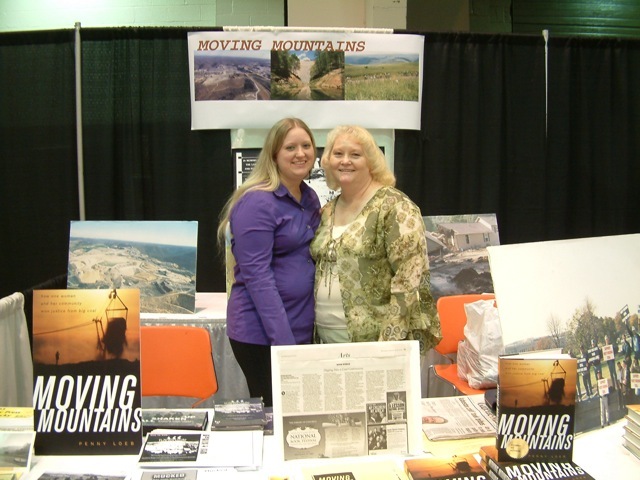 Summer 2007: My book, Moving Mountains: how one woman and her community won justice from big coal, published by the University Press of Kentucky. Won a ForeWord Magazine award and the Harry Caudill Award. Summer 2007: I emailed James Steerman, head of the film department at my alma mater, Vassar College, asking if any film students would like to work on the production. My last semester, in 1969, I took a film class from Steerman, a handsome professor in cowboy boots. No reason he should remember me. But within a few days, he emailed me from vacation in France. A few months later, he sent me a long, immensely helpful, critique. Blew me away! 2008: Rewriting and trying to raise money, without success. Talked with production companies at conferences in Washington DC and New York City. Joined Washington DC based Women in Film and Video, an invaluable resource. February 2009: Took Michelle Farrell’s three-Saturday course (Baltimore, MD) on how to produce a movie. Hands on: camera work, lighting, sound. Asked Michelle if she would be Director of Photography on “Moving Mountains.” Yes, and she introduced me to Stacie Jones, a top production manager for independent films, who would go on to manage “Margin Call,” starring Kevin Spacey. July 2009: Tax credits approved by West Virginia Film Credit Development Committee. Will receive 31-percent of spending upon completion. Tax Credits LLC contracts to buy at 86 cents on the dollar. Huge help. 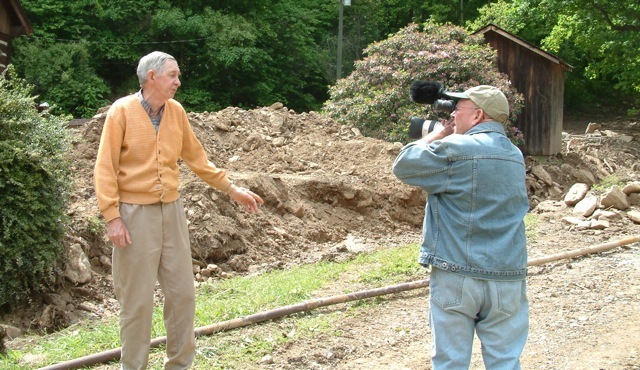 August 2009: Begin talking with Bill Richardson, documentary filmmaker and associate professor at WVU who specializes in tourism in the southern coalfields. For two years, Bill helped rewrite the screenplay yet again, filmed one scene, and was a huge help. When filming was finally definite, however, he was too busy with his life-long passion, the Hatfield McCoy Feud, which became an Emmy-winning three-part series on the History Channel in 2012. Thanks, Bill, for the last line of the movie! Winter 2010: Paul Dinh-McCrillis becomes our energetic casting director. For the next five months, three major stars turned down the part, including Ashley Judd and Virginia Madsen. In October, I chose Theresa Russell from a dozen actresses Paul had selected from the large group responding to his call. She says yes! Winter 2011: Also discovered Stacey Parks, a former foreign sales agent, and her educational Website, Film Specific. The best place for learning all the distribution possibilities for independent movies. Spring 2011: Stacie Jones does a second budget, larger than the first. But still no money. July 2011: Michelle Farrell, the person who finally got me to complete this project, gives me a bargain-basement price. Though doable, waited again, and later learned Theresa couldn’t have done it then. She was nursing her companion; he died in February 2012. May 2012: Talked to Theresa’s manager. She can film in late August. But we need a director, and a production manager. (Stacie had decided to start a family.) Jeanie Clark, who had done other films with Michelle, signs on. No one else could have done the two jobs so well with such a small budget. July 2012: Casting call in Charleson. Six hours. Many good local actors. Greg Harpold appeared last, and blew us away with his monologue from “A Few Good Men,” adding a few coal mining twists. He’ll be great in the role of the miner. Jeanie gets inquiries from a few others after the casting call, including the mother of Rachel St. Gelais a young girl who’s already been on “Homeland.” A natural for Trish’s daughter, Kayla. 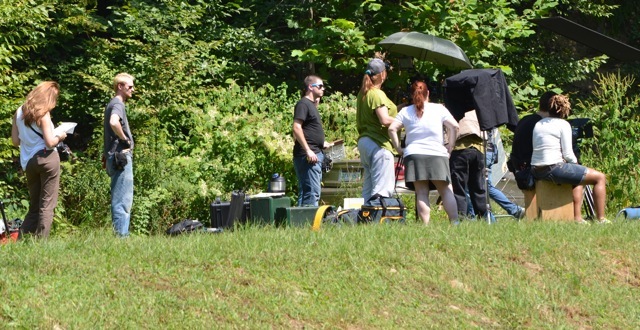 August 29, 2012: Filming begins at Trish’s house in Pie in Mingo County. Crew is staying at a wonderful pair of tourist cabins down the road. Theresa and Tina Alexis Allen, who plays Elaine Purkey, are thrilling the owner of Historic Matewan House. Weather is perfect for the four days of exterior filming. Through September 10, 2012: So much fun. Twelve-hour days. Crew works so hard: Michelle, Megan, Mern, Nate, Rob, Devin, Drew, Torian, Monica, Holly, Lisa, Dustin. Theresa is wonderful!! So down to earth. Doing great work. Elaine Purkey comes to coach Tina Alexis Allen, who copies her accent perfectly. Thrilling me, Vicky Moore, comes and plays herself, along with her younger son, Levi, an extra. One Sunday, Pat McGinley comes to to the set and plays himself in the scene at a valley fill where Joe Lovett, played by Michael Alban, first sees mountaintop removal mining. So glad, a week later, that Debra and Bob Schultz come to the filming, where Debra sings the song she had sung at the 1999 miners' rally at the West Virginia Capitol. Bob and Debra had helped me understand how the struggle impacted miners' families. September 11-19, 2012: Production moves to Shepherdstown, where Cecelia Mason of West Virginia Public Radio helped us secure locations, including The Robert C. Byrd Center for Legislative Studies at Shepherd University. So thankful for this beautiful building with classroom, library, auditorium, conference rooms and offices for us to use. Some of my friends come to play extras. Grateful to Davitt McAteer, who allowed us to film in his law office, and the Shepherdstown Opera House, for letting us film in the lobby. The last day, we lucked into the Christ Reformed Church, with the perfect stained glass windows for Austin Jetton’s scene of prayer and decision. “Amazing Grace,” he sang as he walked out. The sun was setting in a clear September sky as we filmed the last scene nearby at a perfect little front porch. Beautiful end to a long, long journey. Heartfelt thanks to everyone who helped along the way. March 2013: A few scenes must still be filmed. Then we can move on to editing. Now we have to get this movie to festivals, theaters and even on TV!!! August 2013: Scott Carpenter, who plays Judge Haden, in the movie, and has composed numerous movie scores, is creating a beautiful score for the movie. Bob Gates films flood damage. Kayla (l) and Trish Bragg at 2007 West Virginia Book Festival. 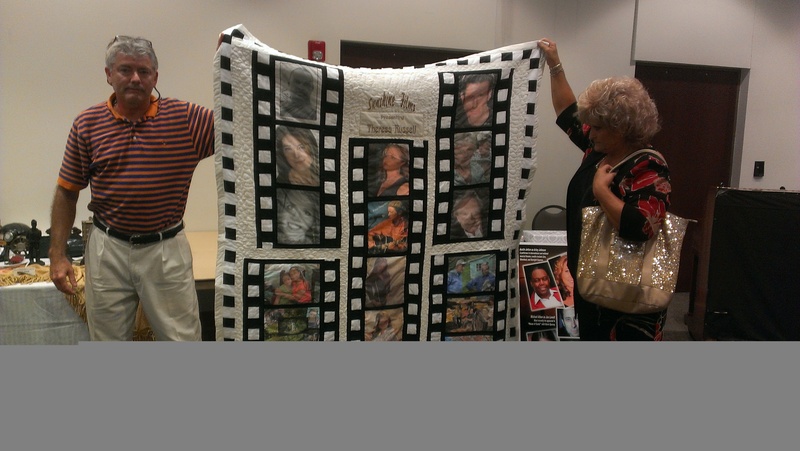 Actor Rick Roberts and Singer Debra Schultz show off quilt Trish Bragg and Arlene Varney made for auction at test showing.